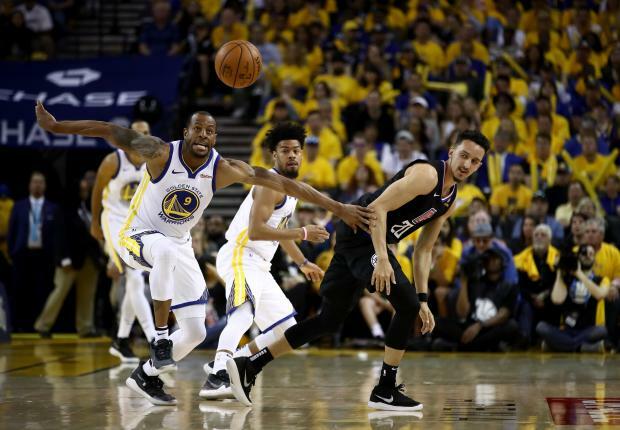 Andre Iguodala (left) of the Golden State Warriors steals the ball from Landry Shamet of the LA Clippers. The Golden State Warriors began their quest for a three-peat by clobbering the Los Angeles Clippers, while the Brooklyn Nets and Orlando Magic delivered a pair of upset victories as the NBA playoffs began Saturday. "We imposed our will for 48 minutes," said Curry. "We have been working for the last month on our collective mindset, raising our intensity and focus. "It might not be flashy but we all got to do our jobs." One of his three-pointers was from a distance of about 30 feet. "Shout out to the contacts," said Curry. "Curry has destroyed us all year," said Clippers coach Doc Rivers. Game two is Monday at the Warriors' Oracle Arena in Oakland, California. Elsewhere, D'Angelo Russell scored 26 points as sixth-seeded Brooklyn jolted third-seeded Philadelphia 111-102 at the Wells Fargo Center to give the Nets a 1-0 lead in the best-of-seven series. Caris LeVert had 23 points while Spencer Dinwiddie added 18 and Ed Davis 12 as the Nets silenced the Sixers' home Wells Fargo Center crowd. Embiid had been doubtful with left knee soreness and was cleared to play less than 10 minutes before the game. Embiid, who missed 14 of the team's final 24 games, looked hampered by his injury. "The fact that it's after every single miss," he said. "Every missed shot, then you get booed. You get the next one and you think 'Should I shoot it or not because I'm about to get booed?'" But team-mate Simmons risked the wrath of Philadelphia's support by lashing fans who booed. "If you're going to boo, then stay on that side," Simmons said. "That's how I feel, if you're a Sixer fan and you're going to boo then stay on that side." "I understand it. They want to see us win. I want to see us win, too," Butler said. "We just gotta do better. I guarantee if we're winning they're not booing. That's how we change it. Just got to go out there and win on Monday." In the day's other Eastern Conference match-up, the second-seeded Raptors were left ruing missed chances after crashing to a 104-101 loss to Orlando at the Scotiabank Arena.